Almost finishing the high season Cubitá tours invited us to a Fam-Trip to Azuero Peninsula. I was excited just by reading the itinerary. My family is from Azuero, so I’m passionate of our folklore and culture. Azuero Peninsula is located in the southern of Panama and provides the best cultural experience. The Carnivals and many festivals are celebrated in Azuero that is conformed for Herrera, Los Santos and Veraguas. The best part is that you have everything close, the historic towns, cultural activities and beaches with crystalline water. We started our trip departing from Multiplaza, Panama City to Azuero. Fabian our guide was so nice giving us some introduction about all the activities we were going to do. Our first stop was at El Caño Archeological Site which is located in El Caño in the province of Coclé. In El Caño was discovered the most important graves in the last 70 years with many pieces of gold and precious stones. It was called by its discoverer ‘El Dorado de Panamá’. We were so lucky because we could see this grave with some archaeologists working on it. Nobody can’t take photos but we will have these memories forever. Then we went to visit two of the oldest churches of America continent with more than 150 years of foundation in Natá and today is stil using. These town are very quiet with a lot of history. Just seeing the houses you almost feel in the 1558 when it was founded the town. At noon Fabian said, the next place was Fonda El Ciruelo to have a typical Panamanian lunch. I definitely have to come back to that Fonda to taste again the best tamales, lechona and biñuelos. With a great lunch, we departed to Guararé to know some local women who make with their hands the beautiful typical dress of Panamá, ‘La Pollera’. We had a nice moment trying to learn with them and appreciating their arts. Continue visiting the towns, we stopped in the house of Mr. José who with his family work creating some diablicos mask. These masks are used by the local people for festivals. After that we went to La Arena de Chitré where a family prepares the best bread of Azuero Peninsula made in a traditional oven. After the last stop we depart to know the hotel. Cubitá boutique hotel with a friendly atmosphere and highlighting the typical Panamanian environment. On Sunday early in the morning we started the day with a good breakfast for then continue our trip to La Hacienda San Isidro located in Pesé in Herrera province to know how two of the Panamanian products are prepared (Ron Abuelo and Seco Herrerano). Just arriving at the farm we stop being transferred by a traditional wagon with cows that was fascinating! We learned a lot about these products and enjoy some cocktails prepared with Ron Abuelo. How much chocolate do the Guna people eat? Jeffrey Barnes, STRI short-term fellow from Dawson College in Quebec asked household heads in Panama’s indigenous community of Aligandi if they had Siagwa (cacao), and answers varied “from a simple yes or no, to an enthusiastic demonstration of their hidden stash” of cacao beans; the source ingredient for chocolate. Others showed Barnes a bag of processed cocoa powder. 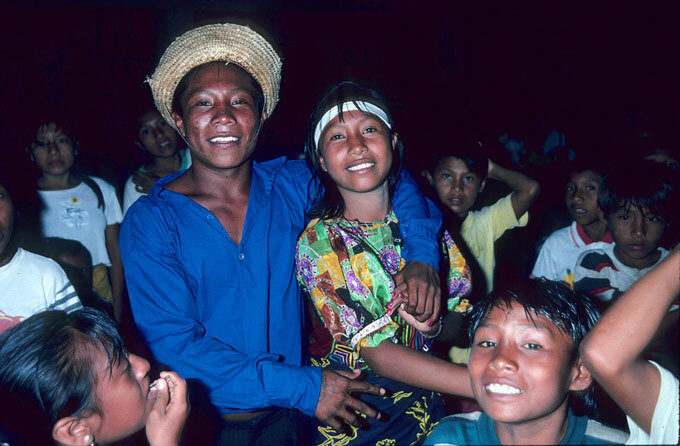 Barnes found the Guna (or Kuna) people hold cacao in high esteem. It is an essential component of countless ceremonies. But, likely due to plant diseases, consumption of Siagwa beverages has remained low since mid-century. In Aligandi, a Caribbean island community, consumption of locally derived cacao beverages is less than one cup per week. Barnes’ findings contrast with studies suggesting Guna consume up to four or five cacao beverages daily. This may have been true in the 1950s, but not today, Barnes contents. High consumption of locally derived cacao has been publicized as key to the cardiovascular fitness of the Guna and used to highlight health benefits of chocolate. In evaluating household consumption of cacao, Barnes proposes a novel method that might help nutritionists to refine their understanding of indigenous diets – a practice that Barnes argues is easier said than done.